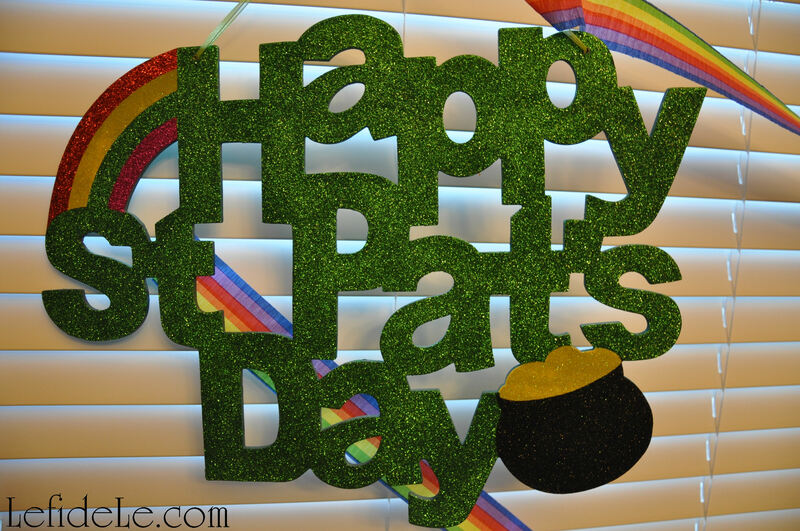 Discover what is really at the end of the rainbow with these St. Patrick’s Day party décor ideas. 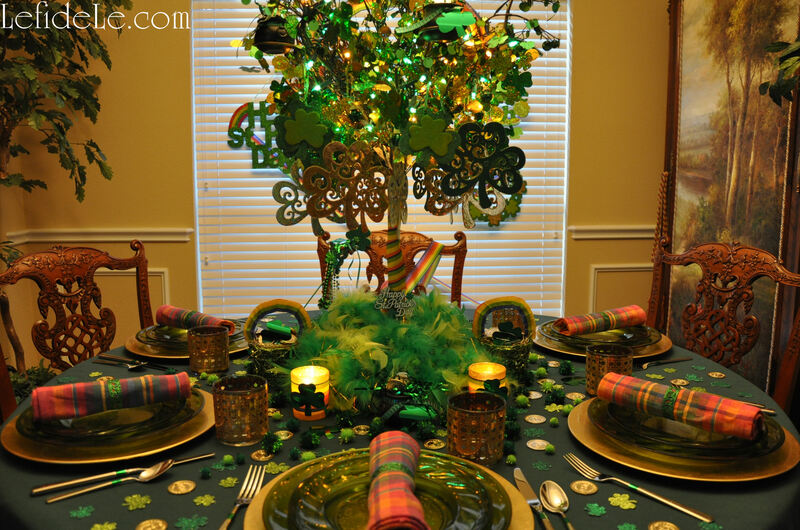 A centerpiece filled with pots of gold will prove that money does grow on shamrock laden trees! 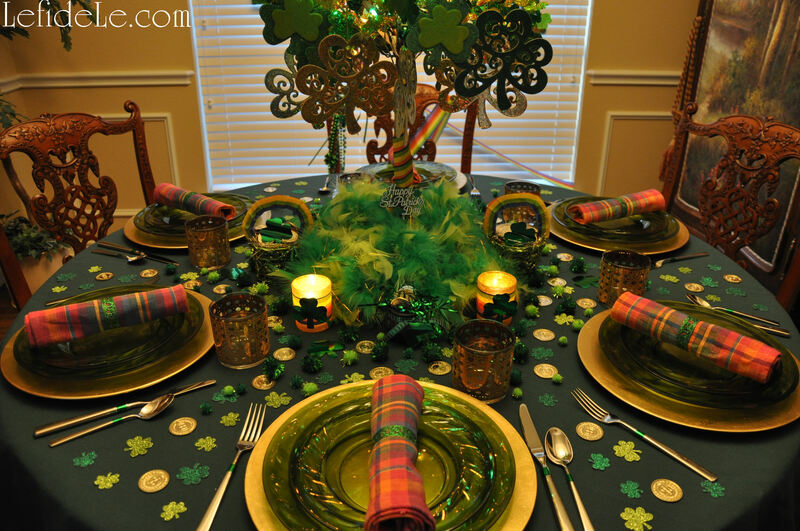 This colorful tablescape is quick and easy to achieve with inexpensive materials and my Quick & Easy Metal Napkin Rings Tutorial, Money Tree + Rainbow & Shamrock Crafts for St. Patrick’s Day Party Décor article to guide you, and use my free printable card to invite your friends to join you for a wee bit o’ whimsy this holiday. This celebration, I really wanted to indulge in a pure state of whimsicality. 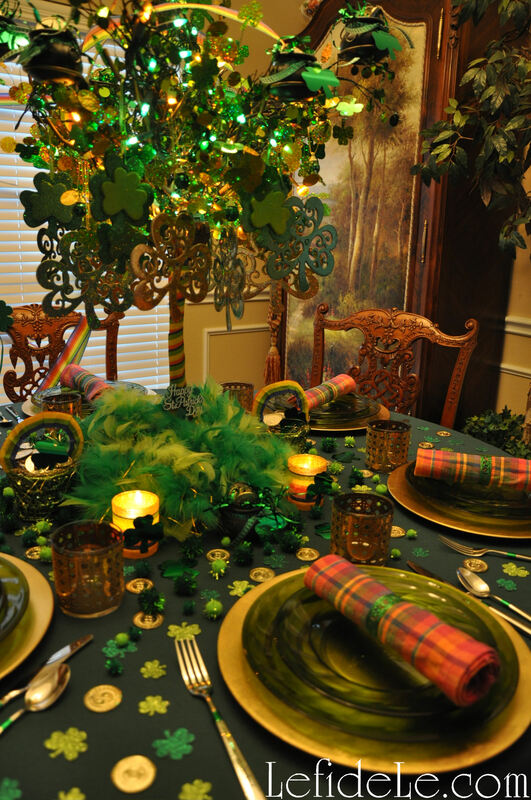 I envisioned leprechauns dining in Seussville… and this vibrant tablescape is what resulted. This may of course be toned down for your own home, taking just an idea or two if you like… but as for me and mine, it’s whimsy all the way. I began with a crisp green field of tablecloth topped with chargers of golden coins. 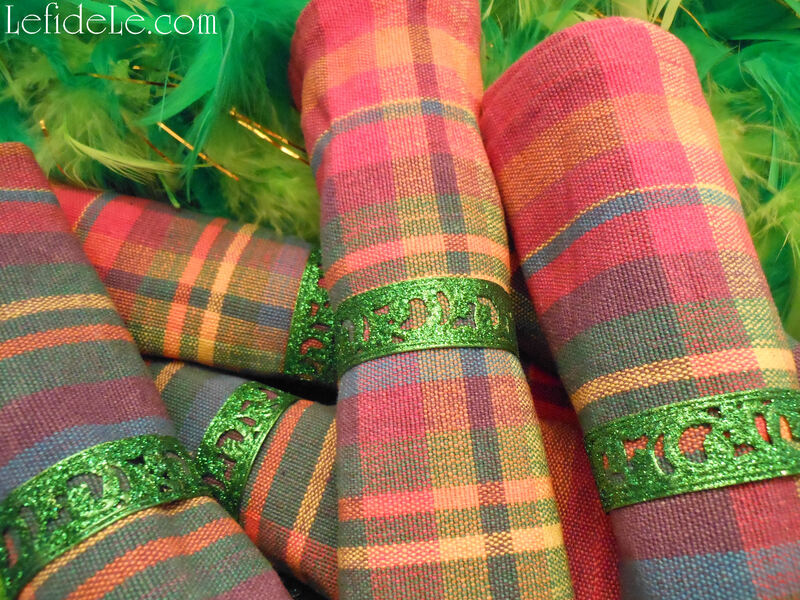 This was layered with green plates and rainbow colored madras plaid napkins ringed in green glittered metal. 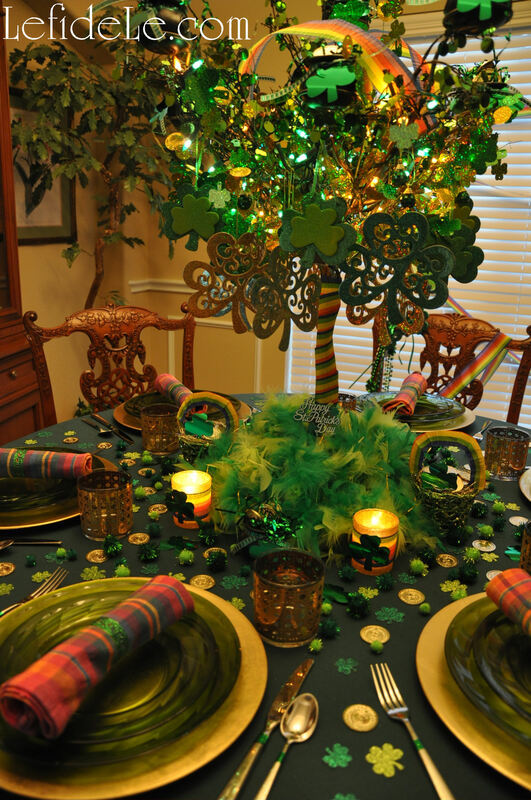 At the table’s center was a money tree with shamrock leaf ornaments, coin-studded branches, with gold and green lights. The base of the tree was encircled with a multi-hued feathered boa and apropos greeting. 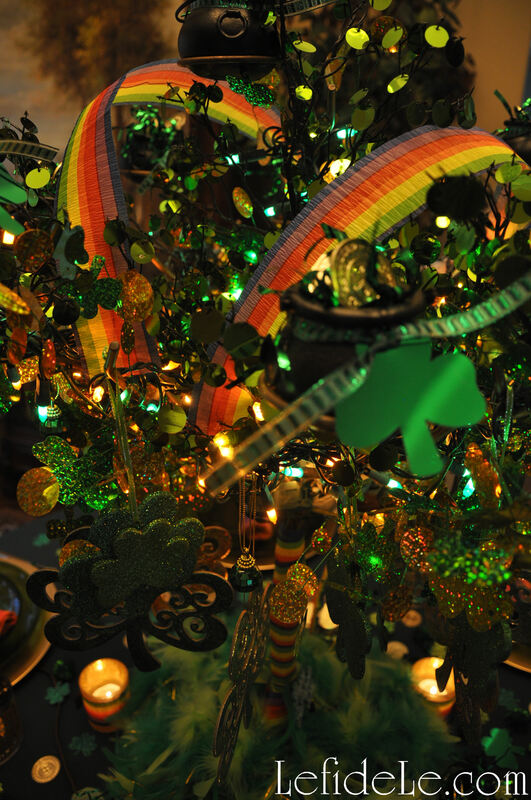 Around that were glowing votive holders and more pots of gold, some complete with their very own rainbows. 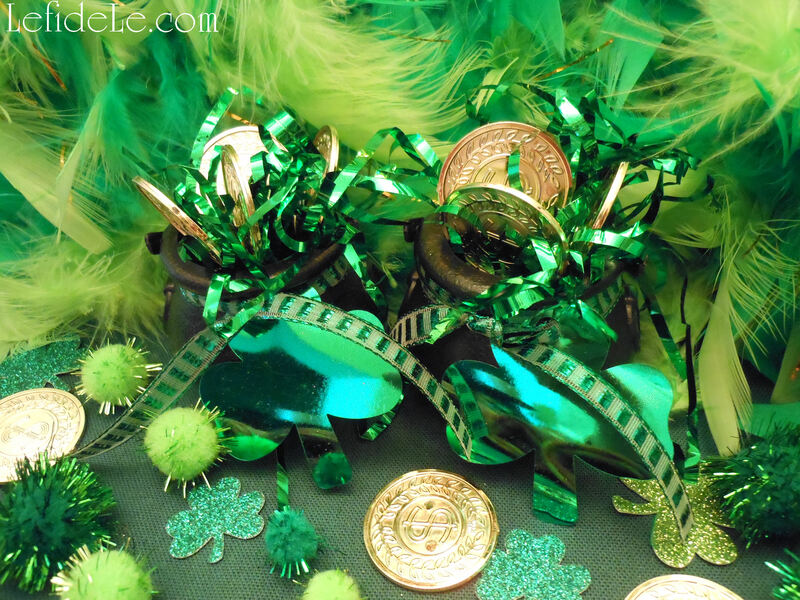 A chair for the guest of honor was draped with a rainbow sash, green sequin tiara, glitter shamrock wand, and metallic beads in various shade of green. This was a device with which to further invite whimsy, because who could maintain a serious façade when someone so adorned is seated across from you? For your celebration, this spot might be reserved for the smallest family member. I confess that I have a lot of fun dressing my grandmother in such crazy holiday attire for her parties at the senior center, and it garners her much attention. Glittered holiday signs strewn with rainbow streamers fill the window in the background. Believe it or not, I actually held myself back from adding many more rainbows… using the rest of my 81 foot roll of crepe paper would have mummified the window blocking out all sunlight! Simply right click on the small image, and select print. Then print it using the color and photo settings on cardstock. Here, I’ve printed them on both plain white stock and a parchment variety so that you may see how paper choice can alter the look of your card. You can also print it in black on green paper. (I’m offering it, along with my other printables free for your personal use. I just ask that my work not be used for commercial purposes.) 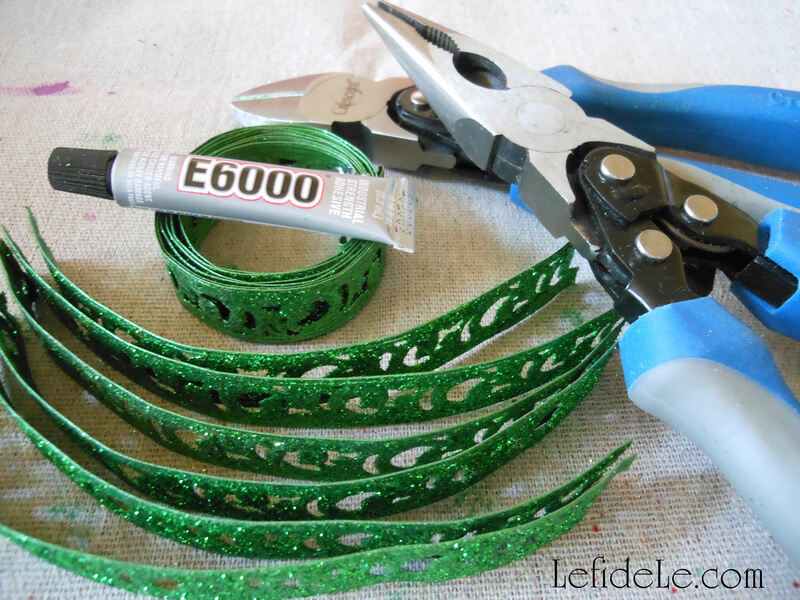 You can even embellish it for a personal touch with glitter glue, stickers, ribbon, etc. 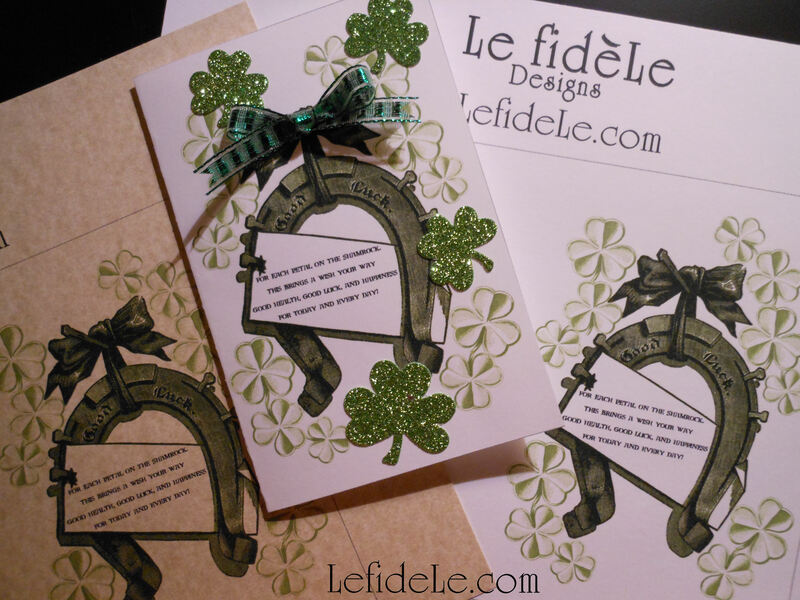 The shamrock stickers I used on the card here are the same kind seen in the tablescape as confetti. A dab of quick dry tacky glue adhered a bow with the same ribbon used on the pots of gold. 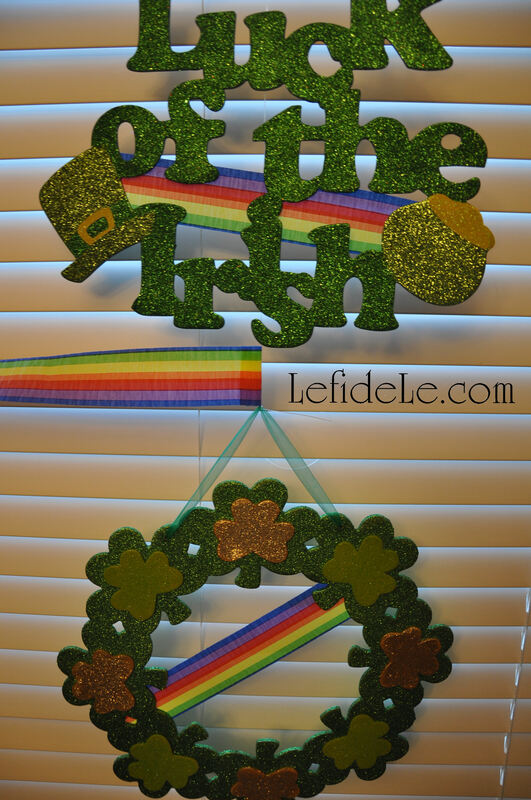 Celebrate St. Patrick’s Day with rainbow filled party décor. 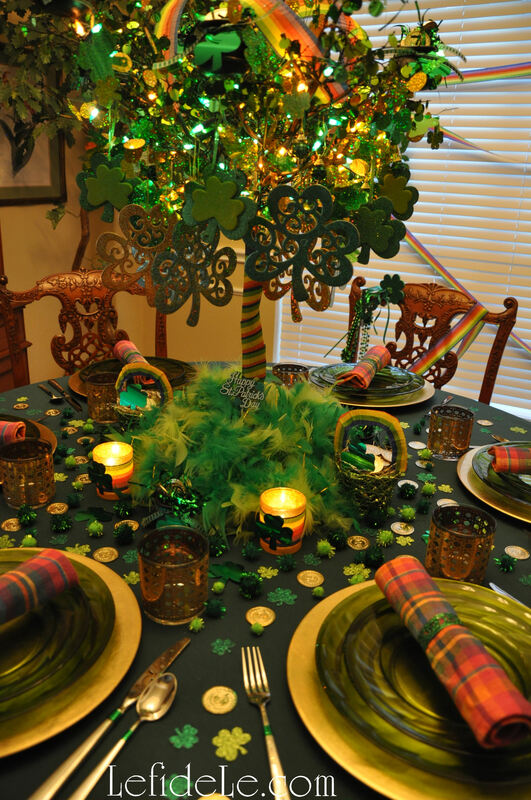 Make pots of gold for a centerpiece to prove that money does grow on shamrock laden trees! 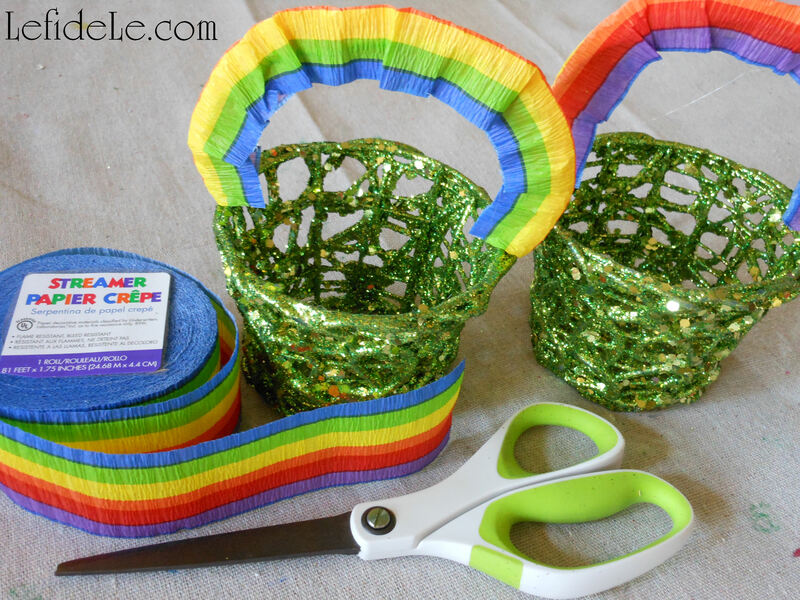 These colorful crafts are quick and easy to achieve with inexpensive materials like metal ribbon for napkin rings and crepe paper for rainbow arches and votive holders. 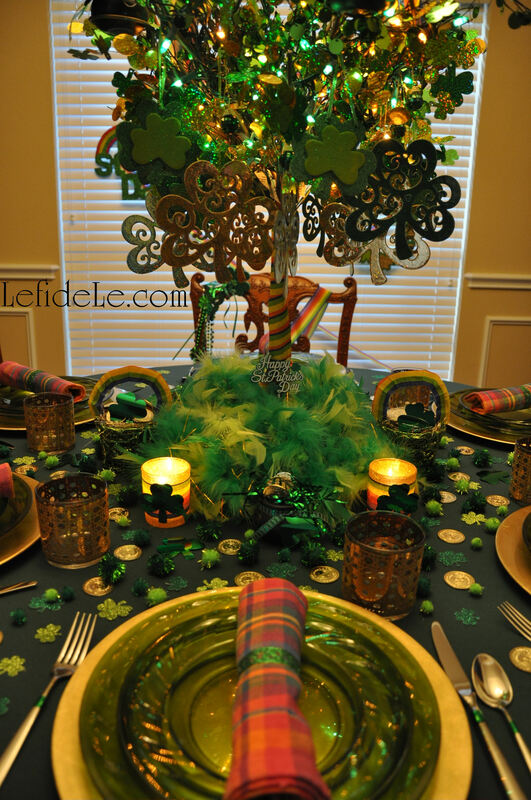 Find my free printable card & invite at the article for St. Patrick’s Day Party Tablescape Décor Ideas, along with how to complete the rest of the celebration. Top o’ this morning’s question is how to fill a party with rainbows without breaking the bank. 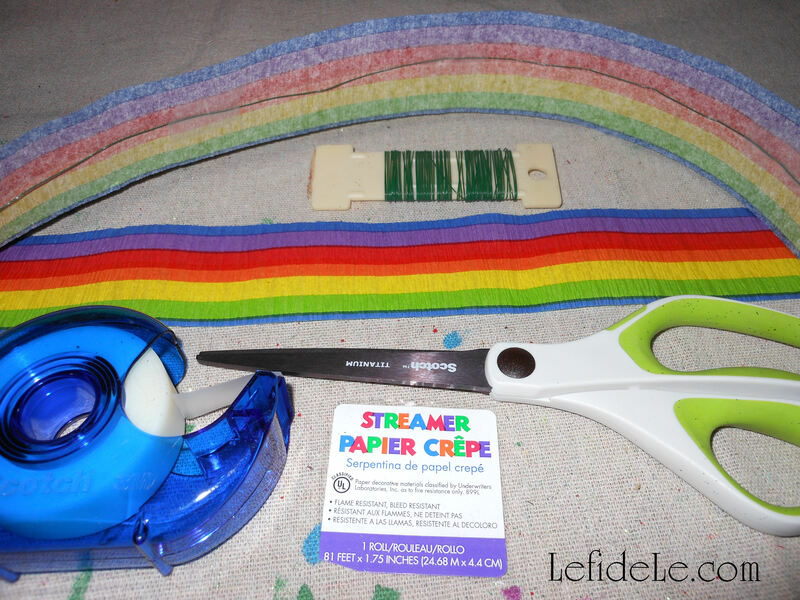 The answer is with crepe paper streamers in a rainbow print… 2 dollars will purchase 81 feet of decorating power! The trick is to use it in the same way you would utilize ribbon. 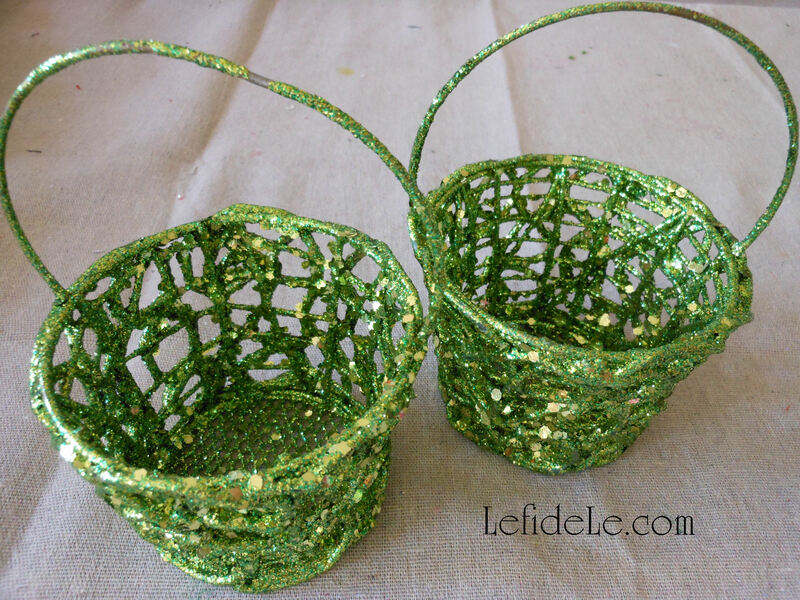 It only took a few inches of crepe streamer to adorn each of the slim handles of glittered baskets, taking them from Christmas to St. Pat’s in a flash. They only needed a few dots of glue to adhere each underside edge to the other, and it only takes a tug to remove the paper and reuse the baskets for the next theme. “Gold” coins atop gold gift bag stuffing complete the pots at the ends of the rainbow. 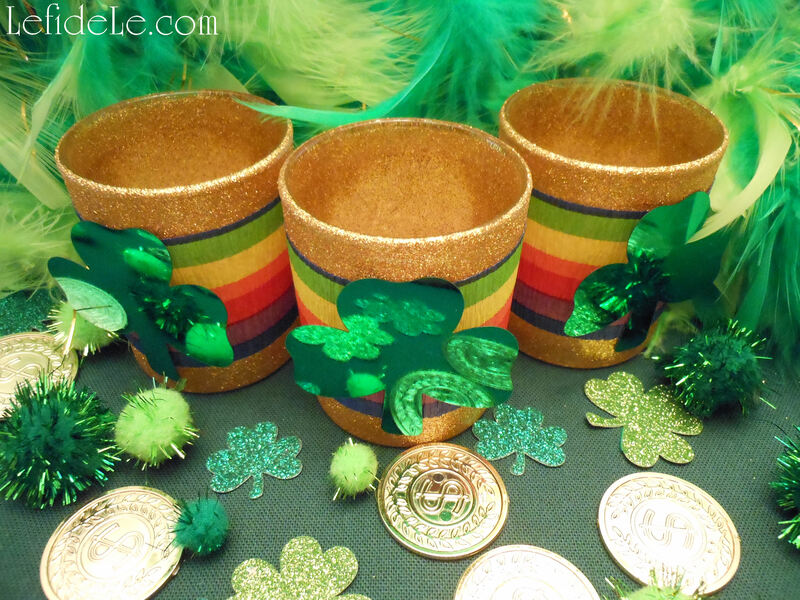 Some of you may have seen my last Mardi Gras Party article where I wrapped gold glitter votive holders with an amazing tri-color tinsel ribbon. 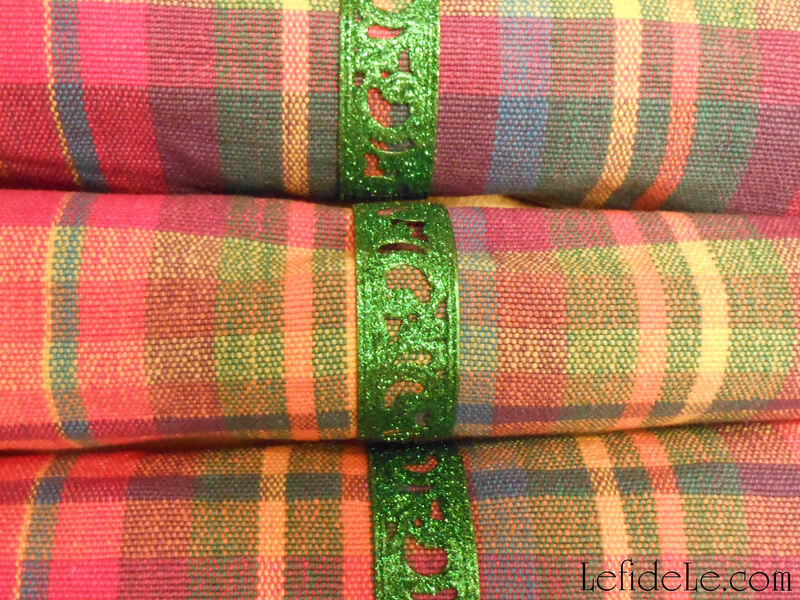 I used those very same glittered holders and wrapped them with crepe rainbows for St. Pat’s. A tiny piece of transparent tape makes them reusable for another celebration, because nothing is attached that will pull the glitter off. 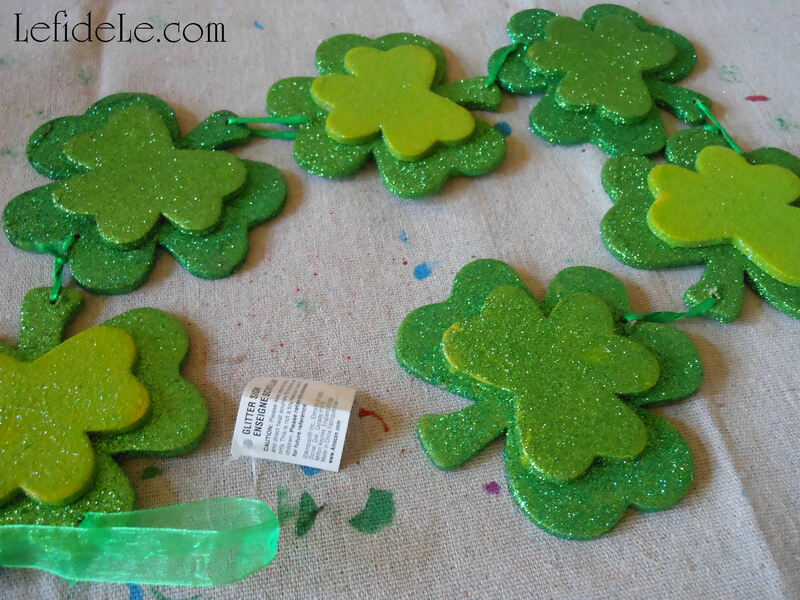 A final touch is to add a piece of shamrock confetti using tape that’s been doubled over. I purchased the confetti at half-off for 50 cents, and had more than enough to spread around, so I decided to decorate little Halloween cauldrons as pots of gold. 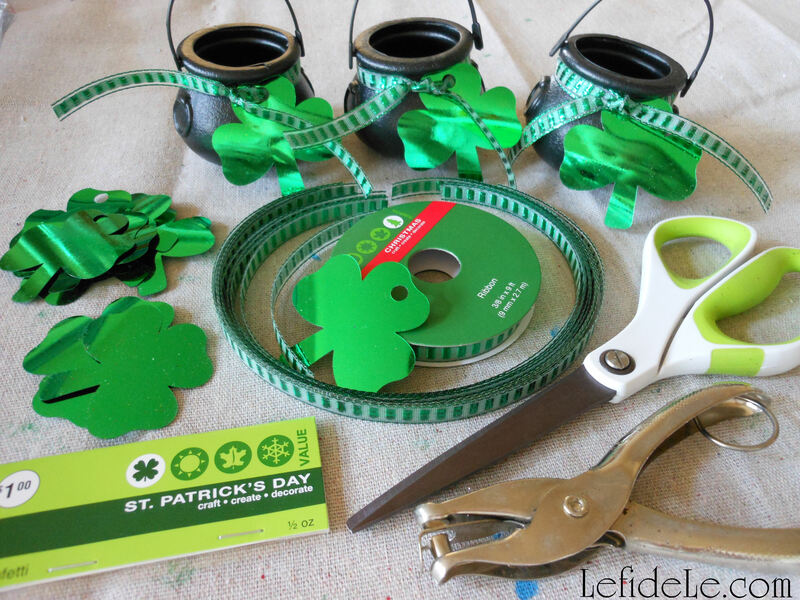 I took a hole-punch to the shamrocks, and then I attached them with strips of two-toned green Christmas clearance ribbon. 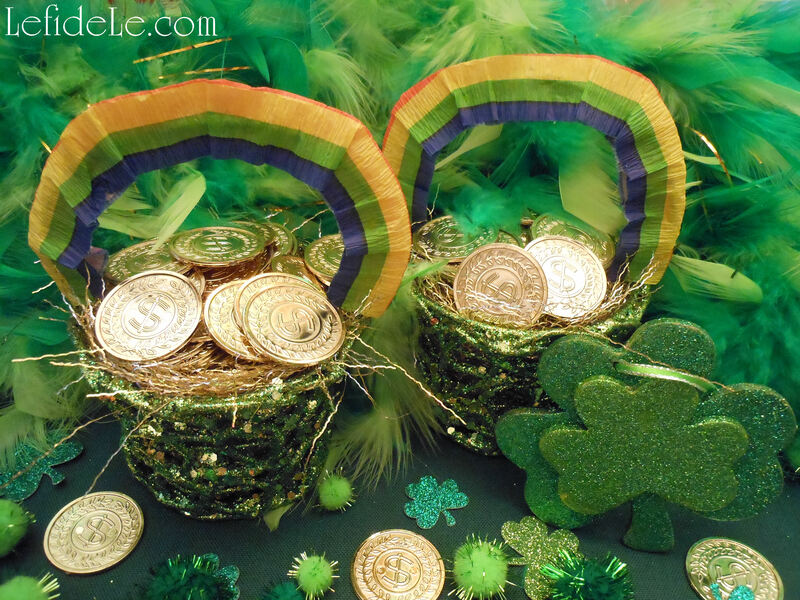 All they needed to complete them was a bit of green gift bag stuffing and some more gold coins… yes, those are the same ones that functioned as doubloon décor at Mardi Gras. Some of these little pots dotted the table, and some sat perched in the shamrock leaved money tree. 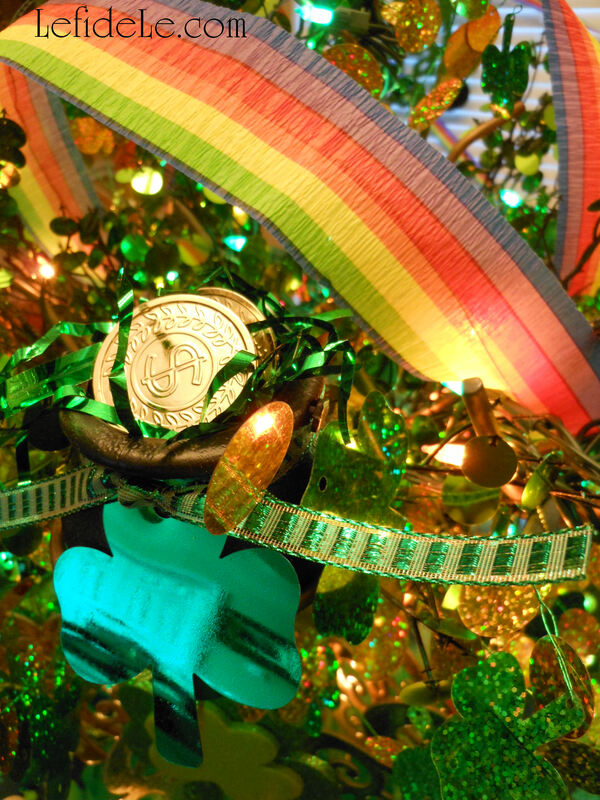 Also gracing the glowing tree were rainbow arches made with the same crepe paper used earlier. I just cut a corresponding length of floral wire and taped it to the center of the underside. This provided a posable structure with which to bend the rainbow to my decorating will… which happened to be filling in some empty space between the branches. 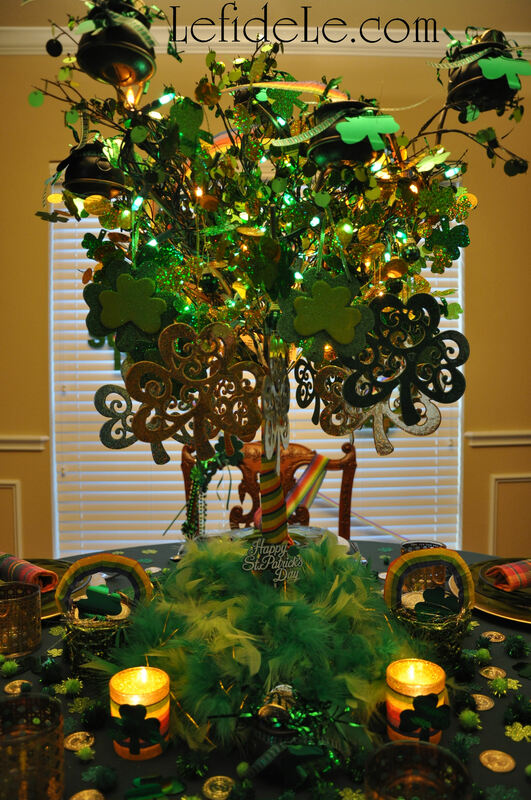 The tree is the same gilded metal one I used for Mardi Gras, but was filled this time with different branches, lights, and shamrock ornaments. 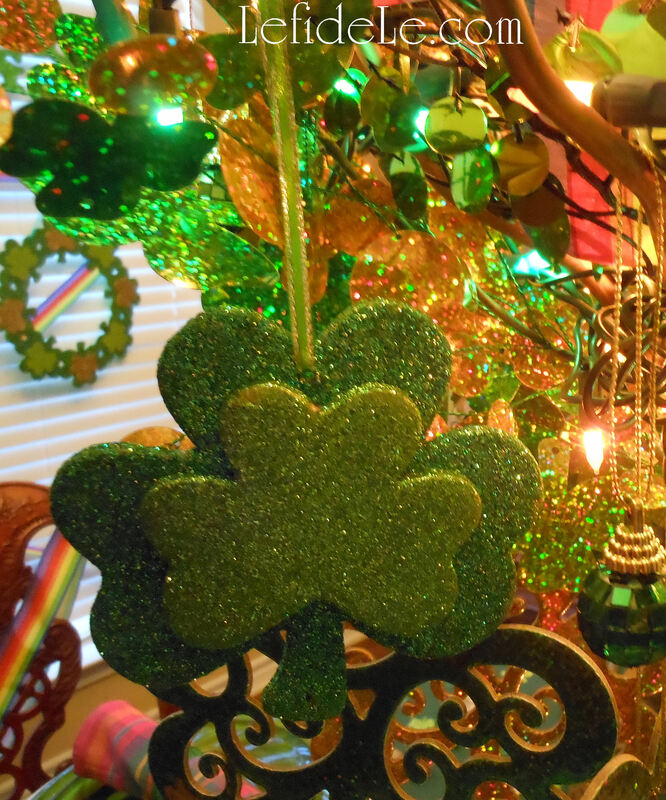 I used holographic branches that were 34 cents each, from last year’s St. Pat’s clearance sale. I filled in with a mylar leaf studded vine that I cut into sections. I found it along with the gold and green lights after Christmas for 90% off. 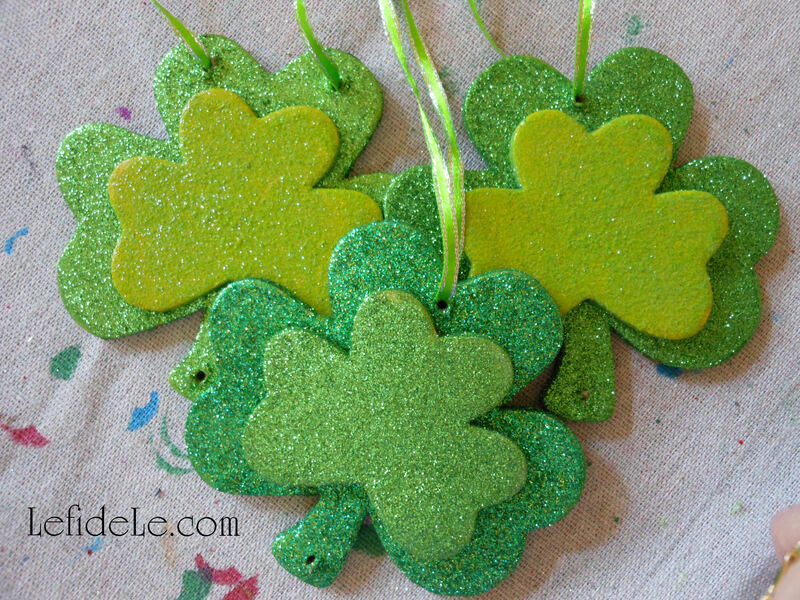 The holographic shamrock ornaments were dollar bin finds, but the glittered wooden varieties were made from a party store sign for a few dollars. All I needed to do was cut them apart and add ribbon loops as hangers. For a future holiday, I can add rainbows or coins for a completely new look. This metal tree has been painted different colors and adorned with a complete range of décor to suit every holiday. For this one, I just wrapped the trunk in more rainbows and laid a green feather boa at its base. This too was found post St. Pat’s for less than 2 dollars. If you plan your theme a year ahead, it’s easy to gather all the material you need for the cost a burger out. Then you can spend your cash on quality ingredients for a fabulous dinner menu! 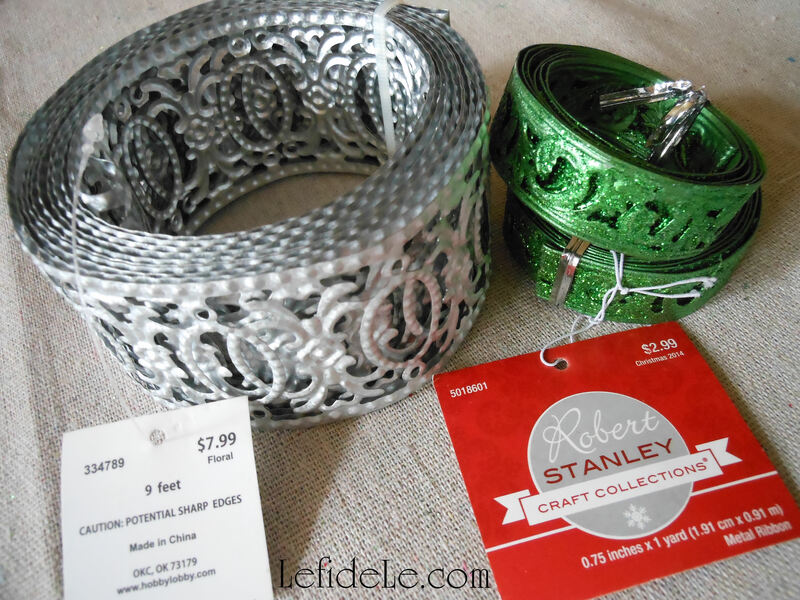 The last, and most fabulous, craft is how to make your own metal napkin rings. 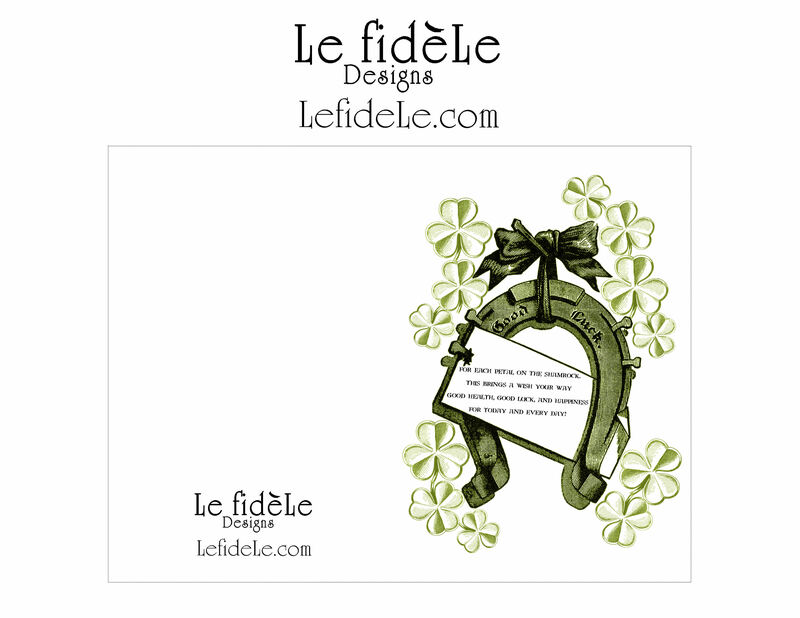 These aren’t just for St. Pat’s but will work beautifully for any occasion. This is because you can find its base of decorative metal ribbon in a wide variety of styles and colors. 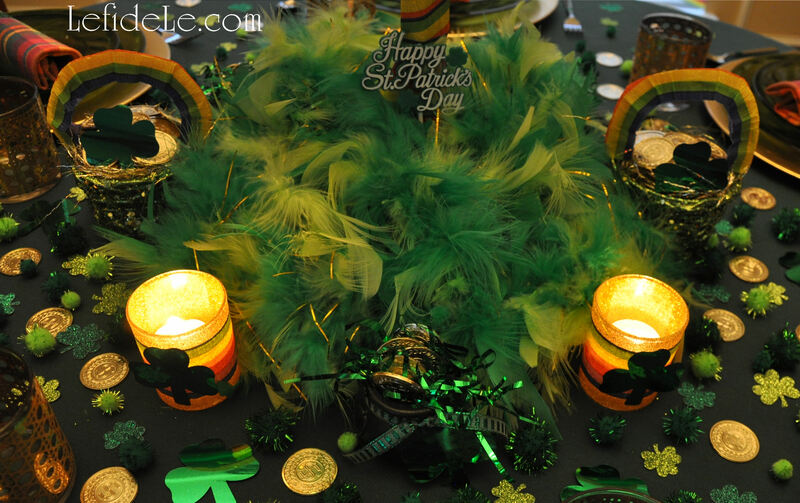 For this party, I wanted to use the green glittered variety to encircle my rainbow colored napkins. Because I found the material on clearance, I made all 6 of them for only 50 cents. First I needed to cut 6 inch metal strips. If you have any trouble cutting though yours, just cut a line into the metal with clippers, and then bend each side of it back and forth until it breaks free. This is much easier on the wrists than brute force. Then bend each strip into as much of a rounded circle as you can get it, and overlap the 2 edges a wee bit. Then glue those edges with E6000 in a well ventilated space. Just let them cure a couple of days before sliding your pretty little napkins through them! 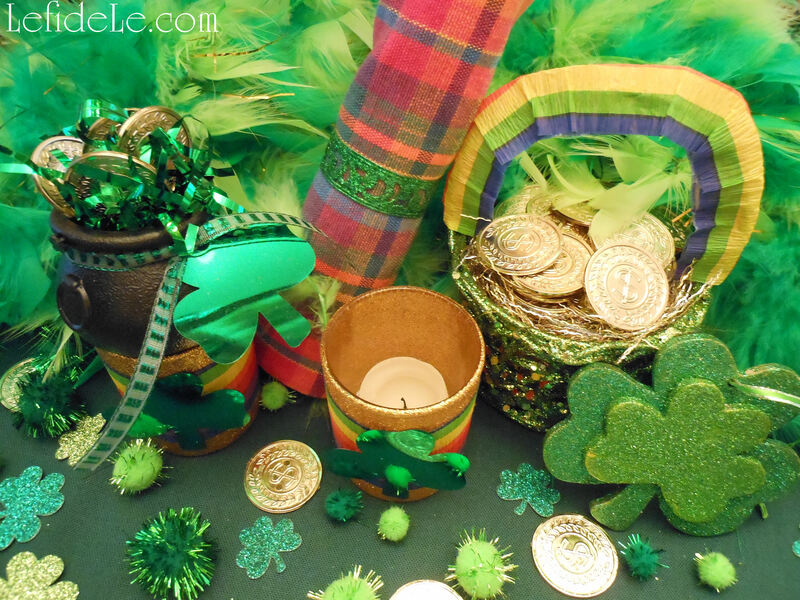 May all your crafting days be filled with the luck of the Irish!